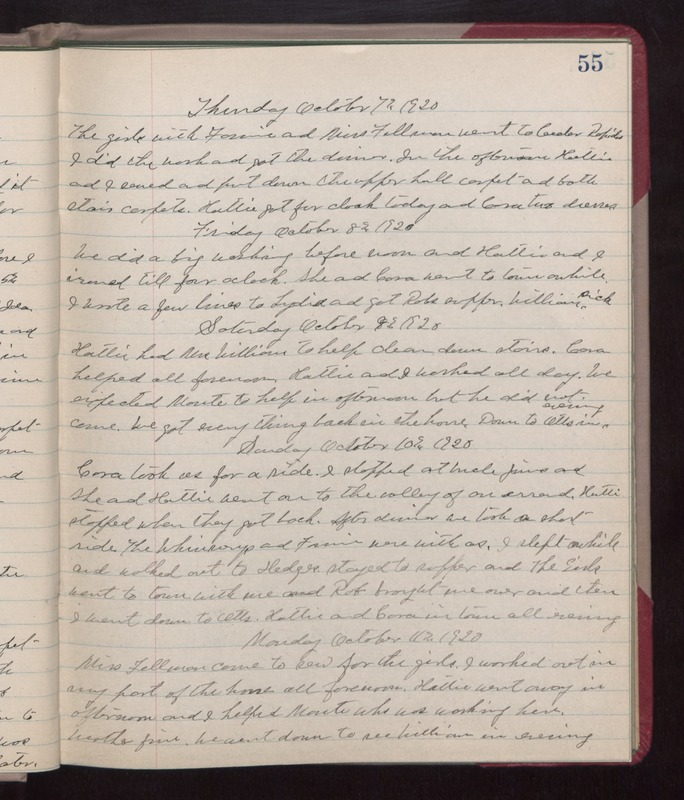 Thursday October 7th 1920 The girls with Fannie and Miss Fellman went to Cedar Rapids. I did the wash and got the dinner. In the afternoon Hattie and I sewed and put down the upper hall carpet and both stairs carpets. Hattie got fur cloak today and Cora two dresses. Friday October 8th 1920 We did a big washing before noon and Hattie and I ironing till four oclock. She and Cora went to town awhile. I wrote a few lines to Lydia and got Robs supper. William sick. Saturday October 9th 1920 Hattie had Mrs Williams to help clean down stairs. Cora helped all forenoon. Hattie and I worked all day. We expected Monte to help in afternoon but he did not come. We got every thing back in the house. Down to Otts in evening. Sunday October 10th 1920 Cora took us for a ride. I stopped at Uncle Jims and She and Hattie went on to the valley of an errand. Hattie stopped when they got back. After dinner we took a short ride. The Whinerys and Fannie were with us. I slept awhile and walked out to Hedges stayed to supper and the Girls went to town with me and Rob brought me over and then I went down to Otts. Hattie and Cora in town all evening. Monday October 11th 1920 Miss Fellman came to sew for the girls. I worked out in my part of the house all forenoon. Hattie went away in afternoon and I helped Monte who was working here. weather fine. We went down to see William in evening.